The first, and most prominent to me, was the question that I have not been fully able to answer across all three blogs: If this wasn’t all about Apple, would we really have cared? Did Mike Daisey’s story of Foxconn, beit true or false, only catch our attention because it was about a Man and a Company so revered by us that we couldn’t dare imagine Apple as being anything but the most ethical, the most innovative, and most popular company. But what if Mike Daisey had chosen to highlight Foxconn’s conditions under the context of Samsung, or Nokia? Would TAL have given it airtime? Would he have been asked to come to speak at tech/no? The answer I tend to believe is no, and it brings me back to my blog post from Blog I. Our obsession with Apple, the creation of the Apple ‘cult’, is what gives this story its sensationalism, but also desensitizes us to the true message. In his first blog, Daisey says “[…] the most dangerous thing in any religion is when people start to think”. Until the Foxconn scandal publicity, and Mike Daisey’s story, no one had thought twice about where their beloved iPhone, or MacBook had come from. What made Daisey’s story resonate so strongly, looking in particular at our class, is that it made us question the ethics of Apple, and ourselves. I wrote my first blog on how both we, and Apple share the blame for making/supporting unethical decisions. It made us all feel somewhat guilty as we held our iPhone, our MacBook. Referring back to the latter observation of desensitization, I think this speaks to our ability to forget and forgive Apple. Amidst the height of the publicity in the Foxconn ‘scandal’, Apple’s stock showed no sign of downturn. Each of us including myself wrote passionately in opposition to the Foxconn atrocities and to Apple, but followed by stating that it would not be enough to prompt us to ditch our iPhones or MacBooks. The portion of Daisey’s monologue where he talks about how Apple often decides for us what it is we ‘want’ as consumers (i.e. the iPod Mini – iPod Nano case), speaks to the nature of the relationship Apple has with its customers. Our relationship with Apple and its products is so deep that we marginalize some 430,000 Chinese workers in favor of technological innovation- but this not a character flaw of ours. We are used to being told by Apple that its latest innovation is what we want. We subscribe to this and to Apple, as they are often right. We have come to accept Apple, and accept what goes on at Foxconn largely because, at least on my part for one, Steve Jobs and Apple have told us that they have the situation under control. 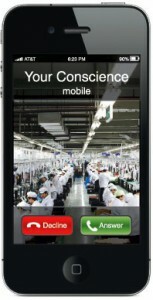 That Apple is taking steps to ensure ethical business practices at Foxconn. I am not using this as a platform to question Steve Jobs’ credibility; moreso I wish to highlight just how much the entire narrative is driven by our obsession with Apple. The story’s rise to prominence, and eventual diminishment. The second point that stood out to me was the speech offered by the Chinese professor (whose name I did not fully get). The importance of his point about understanding the context behind what we hear about Foxconn cannot be overstated. I think this assertion speaks to some of the main themes that we have struggled with over these few blogs. Art vs journalism and the truth. Speaking on journalism and truth, for me this section about China reminded me of themes from my anthropology class last semester. Cultural relativism, as we learned, is the principle that human’s beliefs and activities should be understood and analyzed by others in terms of that individual’s own culture. In this case, understanding how important the job at Foxconn is to these employees is critical in judging the facts about Foxconn. Understanding the type of person who works at Foxconn- individuals coming from rural villages hoping to make a living at a revered position, is far different than the description that Mike Daisey, or any media outlets, have given to the Foxconn employees. The Professor cited cultural and social gaps between the US and China which make it difficult for us as Americans to judge the practices we hear about at Foxconn. This for me relates back to the theme of trust in journalism, for how can we truly understand what is actually happening at Foxconn without understanding the cultural context? This is a lesson I will carry on with me, and is one that would have significantly impacted my reactions to this entire Mike Daisey narrative. I think after all this the moral of the story is that as citizens of an increasingly globalized and transparent society, we have an opportunity, and arguably an obligation to seek out the truth for ourselves. You made a really eye-opening point, at least in my opinion. Honestly, I have no idea who the founder or head of Samsung and like companies are, because our society (at least to my knowledge) has not followed the creation of such businesses, like we have with Steve Jobs’ business. I feel like regardless of your preferred tech company, Apple is always in the news, and most everyone, if they have any connection to the modern world, is relatively aware of the fact that Apple is frequently in the news. I mean, how big a deal is it when a new Galaxy comes out? Is it on the front page of the Wall Street Journal or all over the national/ international news for days or weeks? If companies like Samsung or Nokia were in the headlines with similar scandals that Apple had, would people care as much? I don’t think so. I really like that you brought this up because it made me think about the situation further, and made me think about how big of an influence one small logo can make on the world. Cate I wanted to respond to your comment because I like how you “dig deeper” into the point that Jack is trying to make. It’s true that we don’t care very much at all about other electronics companies. I feel like even non-Apple users are still aware of what Apple is doing and not as much concerned with their own phone company. And I agree with you that it’s because Apple is so talked about that when this scandal hits the news, people only read that this is Apple’s factory, whereas in reality, every brand of electronic device is made in this same factory. We definitely have not heard as much negativity towards those other companies. Is this just due to the size of the market share for Apple products? We hear about Apple because it is the biggest, as well as the most culturally relevant. Nokia isn’t so much a household name, even if it’s products are. Apple has approached its entire company mission very differently than other tech companies. You are getting to know the brand as much as the product with Apple. For lack of efforts, or just failure to engage its consumers, other companies are too different to compare in this way. This strategy backfired for Apple, but was beneficial for the other, equally complicit, tech companies, when Daisey’s story hit the news. Christian, I liked your explanation on the possible reason for why the scandal was much more high-profile than if it would happened at a competitor. I agree that Apple does (still, although perhaps diminishing lately) have a reputation for being innovative, which puts them in the forefront of the consumers’ attention. The question then is…Apple has differentiated itself from its competitors…but at what cost…and are these supported by Apple or are they just externalities? Great point Vlad. I think the idea of Apple differentiating itself from consumers is one I wish I could have touched on. Foxconn exists as is, the good and the bad, arguably all due to the obsession Apple has with staying ahead of the curve. Apple coming out with new products each year, and new design iterations of the same product, makes Foxconn operate constantly on overdrive. Apple differentiates itself from Samsung, Nokia, Sony, by being the most innovative. But I never really thought about at what cost this comes by. I really liked your third point about cultural relativism. I think it is super important that we understand that we are judging Chinese factory conditions from an American point of view. In China, as the professor pointed out, the labor expectations are very different. It is hard for us as Americans (and, more specifically, Bucknellians) to understand this very different lifestyle. Storytelling then has to be contextually situated, or spoken in broad enough terms that many audiences can identify with the message. I don’t think the latter is possible; rather, I think it is important that we recognize our judgements and perspectives when we approach these topics (hindsight is usually 20/20). I’ve been talking about narrative truth in my comments. Here is another one; the idea of personal technology, Apple’s own strategy as we saw in the case, is the double-edged sword that makes the company more susceptible to criticism or pressure from stakeholders. The emotional content of the brand, of the experience, binds customers to Apple, but it ALSO binds Apple to its customers’ concerns.